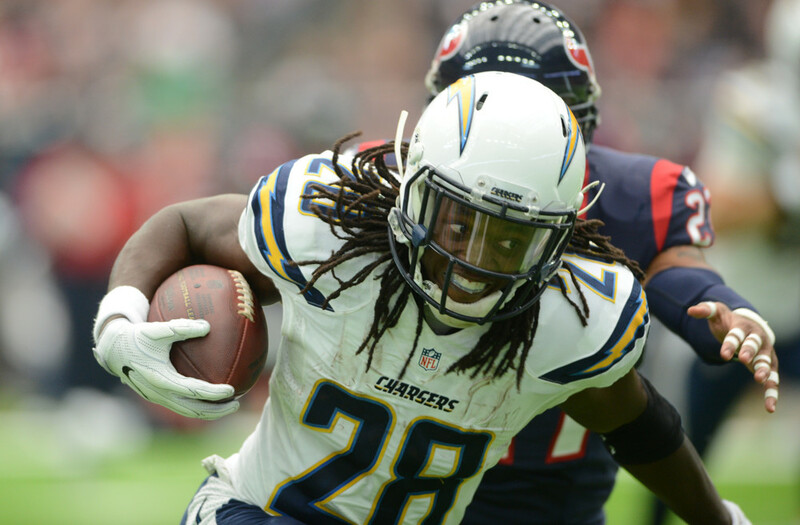 Melvin Gordon experienced a breakout campaign in his second NFL season. Playing only 13 games, he amassed 997 yards rushing, 419 yards receiving, and 12 total touchdowns. This was a drastic improvement on his rookie season, when he totaled 641 rushing yards and no touchdowns. 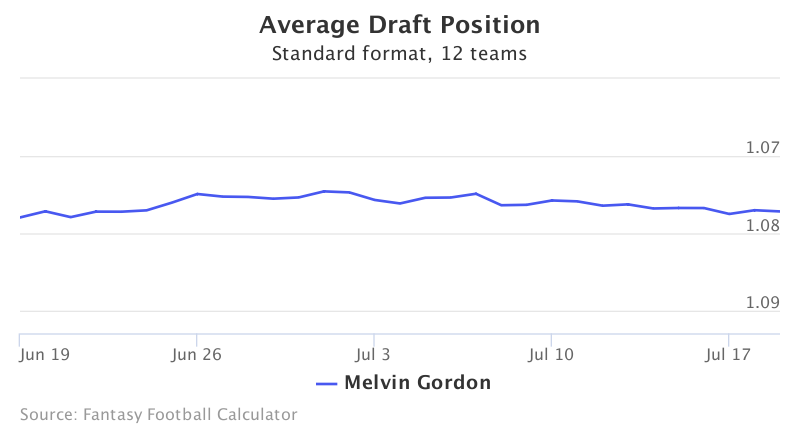 The graph below shows Gordon’s steady fantasy football ADP over the past month. Data is from 12-team standard mock drafts. Gordon currently sits just behind LeSean McCoy in the middle of the first round, largely due to his secure role in Los Angeles. Although productive, Gordon has not been the most efficient runner during his time in the NFL. He fell short of 4.0 yards per carry in both of his first two seasons, finishing with 3.5 and 3.9 respectively. However, its volume that makes Gordon an attractive fantasy running back. He averaged 19.5 carries per game in 2016. Extrapolating that rate across 16 games, he would have finished 2nd in RB carries. In addition, Gordon increased his work in the pass game, averaging 4.4 targets and 3.2 receptions per game. This volume allowed Gordon to finish with 77.4% of the running back touches on the Chargers last season. With only Branden Oliver and Kenneth Farrow behind him, Gordon should see a similar share of the touches this season. Additionally, Gordon plays a valuable role for the Chargers in the red zone. Gordon finished 4th in the NFL with 52 red zone carries in just 13 games. This was a sharp increase from 2015, when he carried the ball just 12 times in the red zone. This volume helped contributed to his large touchdown total in 2016. Going at 1.08, Gordon has fallen one pick behind LeSean McCoy. Given the scarcity of running backs with large workloads, Gordon is a safe pick at the end of the first round. Draft Gordon with confidence, knowing he will be one of the league’s few feature backs.